Violence was a way of life for Dayna when he was growing up so when he had his own children, hitting them was the only form of discipline he knew. Dayna would take out his anger and hurt on his kids – until the day they were taken away and he realised he would have to make big changes to get them back. When he referred himself to a 14-week The Incredible Years parenting programme run by Family Works, his two facilitators constantly lifted him up and supported him to become a better parent. 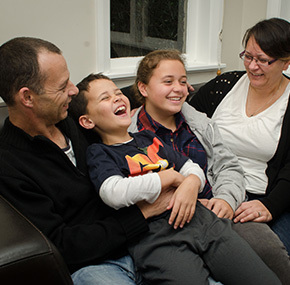 Family Works helped Dayna to break the cycle of violence. He now connects well with his children who love being with their dad and are no longer scared of him.